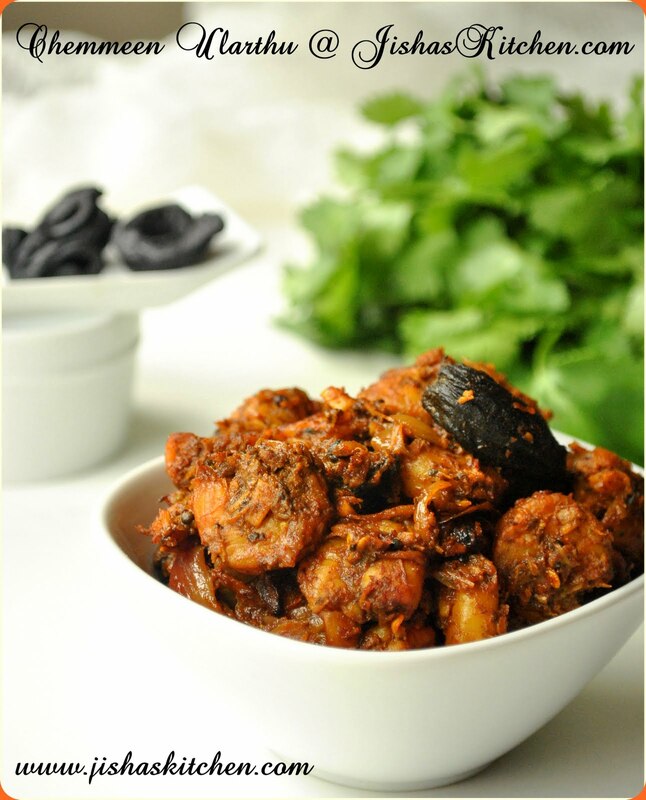 Today I am sharing the recipe of Kuttanadan chemmeen roast / Kuttanadan konju ularthu / Kerala konju roast. For making garam masala : Grind 2 cardamoms, 2 cloves, 1 small cinnamon stick, 1/2 tsp peppercorns and 1/4 tsp fennel seed. First wash the kodampuli nicely and then soak it in 1/2 cup of water for about 15-20 minutes. Then marinate the cleaned prawns with 1/2 tsp turmeric powder, 1/2 tbsp lemon juice and salt and keep it aside for 15 minutes. Then heat little oil in a pan and add mustard seeds, when it crackles, add sliced shallots, chopped green chilies, ginger, garlic, half of curry leaves and then saute till onions become soft. Then lower the flame and add red chilli powder and 1/2 tsp turmeric powder and fry till the raw smell of the powder go. Then add garam masala along with prawns, soaked kodampuli and 1/4 cup of water and cook covered in low flame for about 10-15 minutes. Then cook uncovered till all the water in it gets evaporated and the prawns become almost dry. Then add grated coconut along with remaining curry leaves and mix it nicely. Finally add 1 1/2 - 2 tbsp tbsp of oil and roast the prawns for another 5-10 minutes and remove from the flame. Yummy chemmeen roast..liked the spice mix and clicks!! Wow looks delicious and very tempting. 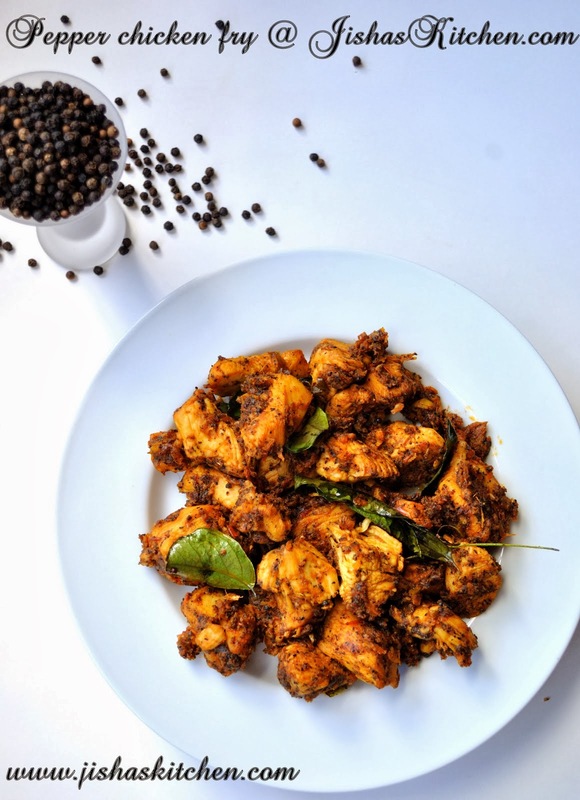 Chemeen roast adipoli. veggie aya ennikum vayil vallam varunnum. what to say as usual WOOW.... great tempting dish looks very colourfull..nice pics too..
shrimp roast looks very tempting and lovely color !! Brilliant ! Deliciously mouthwatering roast dear. Already drooling over it. Love any shrimp/prawn preparation. This is one of our family favorites. The pictures are a beauty! The roast is hot and delectable! Awesome with some white rice! 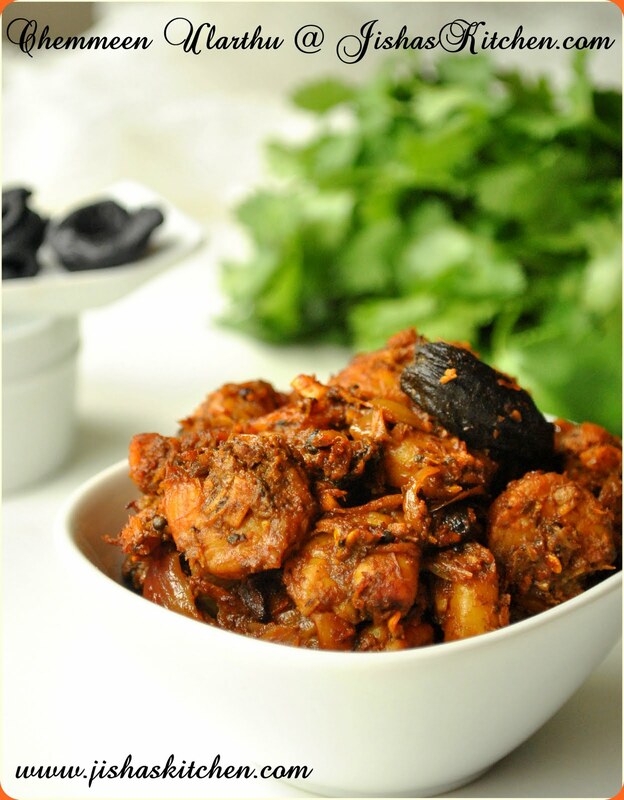 Curry looks spicy and yummy.. Prawns are always my favorite..
entammo..kothippichu konnu.super duper Jisha..A very committed recipe with nice clicks ! No one can go from here..the aroma wafting around. 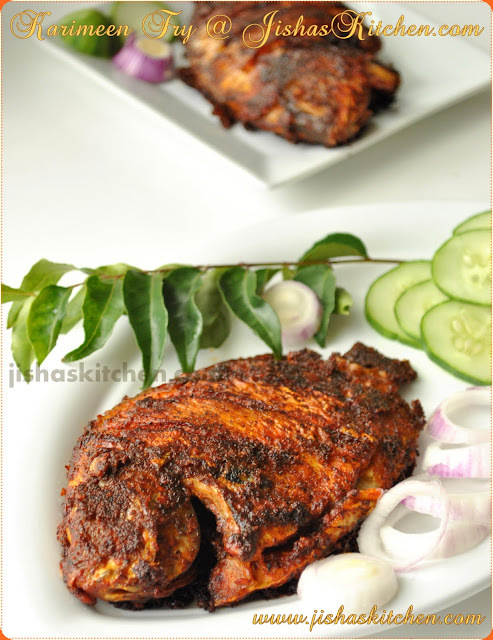 Chemmeen roast looks simply out of the world, very much tempting..
Hey..Jisha you are always Making mouthwatering recipe..I cant control...so tempting.. Absolutely delicious and drool worthy..nice recipe ill surely try this. Very nice recipe. I like the Garam masala with Fennel touch. This is the first time I've come to your blog..and am glad you did! Great pics, feel like eating right out of the computer! I've posted a prawn roast recipe on my blog too. Do chk it out n let me know your thoughts!